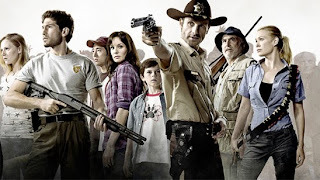 American TV series 'The Walking Dead' makes it way onto UK terrestrial tv for the first time this evening. For those who didn't get a chance to watch the zombie apocalypse show during its run on FX earlier in the year, Channel Five is the place to tune in. FG writer Jake has already reviewed the series so for links to all his reviews - which do not spoil major plot points, unless you read too far ahead in time - look below. Jake was a fan of the Frank Darabont ('The Shawshank Redemption', 'The Green Mile') series but reserved special praise for the "epic, emotionally deep and exciting almost-feature-length pilot". Hopefully, you'll feel similarly. 'The Walking Dead' begins on Channel Five tonight at 10pm. For further details, visit the Channel Five website.